These guys were hilarious and so much fun to work with! 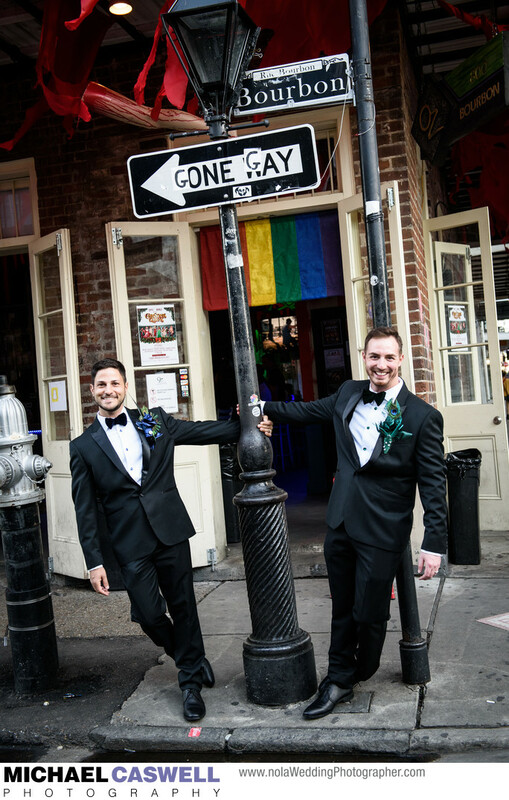 Their wicked sense of humor led us to capture this photograph by a one way sign on Bourbon Street that someone has mischievously altered to read "gone gay", which they had spotted while walking around the area the previous day. This wedding was interesting in that, despite it being a very small wedding with less than a dozen friends and family in attendance, because they wanted to get married on Halloween in City Park but also wanted portraits in the French Quarter, we actually split up the coverage into two days, shooting the grooms getting ready at the Cornstalk Inn Hotel and the portraits in the French Quarter the day before, then the Voodoo-inspired ceremony in the park on Halloween.